Usage: Take 4 tablets per day with meals, or as directed by your qualified health consultant. Note: Individuals who are diabetic, being treated for glucose control, pregnant or lactating should consult a health care professional before using this product. 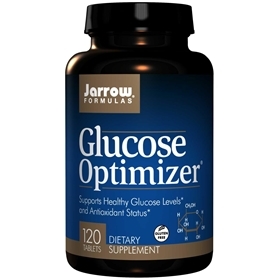 Glucose Optimizer is a comprehensive combination of nutrients that improve glucose metabolism and antioxidant protection. • Alpha Lipoic Acid facilitates reduction of blood glucose and supports general metabolism by its effects on energy production. • Gymnema, Bitter Melon, Fenugreek and Eucalyptus are herbal extracts that have glucose regulating properties. • Green Tea Extract (45% Polyphenols) supports the strength of capillaries and other blood vessels. • Magnesium is involved in the metabolism of glucose and production of energy in the form of ATP. • Bilberry promotes healthy eye function and circulation. Other Ingredients: Cellulose, dicalcium phosphate, crosscarmellose sodium, stearic acid, magnesium stearate and silicon dioxide. Contains: Soy.